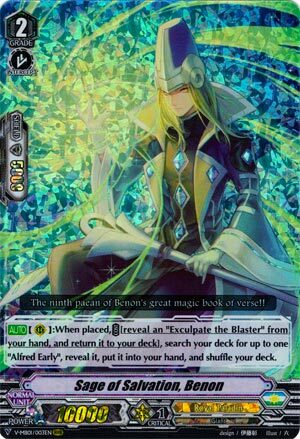 [AUTO](RC):When placed, COST [reveal an “Exculpate the Blaster” from your hand, and return it to your deck], search your deck for up to one “Alfred Early”, reveal it, put it into your hand, and shuffle your deck. We don’t have a Roman for Exculpate, so instead we have this. Honestly though? Why Alfred Early? He takes a Blaster Blade out the soul, and Exculpate runs directly contrary to that by needing to ride Blaster Blade from the soul. And because of how the deck is structured, you can still ride decently consistently given the sheer filler in Royals and barely touch the Grade 3 lineup at all: I myself would run 12 G1s, 11 G2s, 7 G3s and 3 Exculpate and mathematically ride consistency wouldn’t be hurting that much. Nice, but unneeded. Run what fuels your main gambit first.